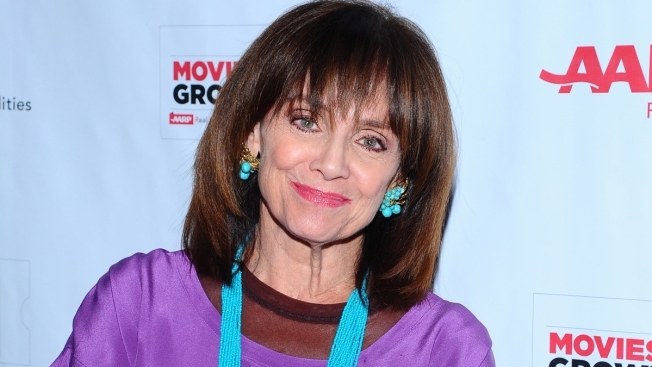 Valerie Harper is back at work in the short film "My Mom and the Girl." This is what a tough cookie Valerie Harper is: Despite her prolonged fight against cancer, she accepted the demanding role of a woman with Alzheimer's to draw attention to the disease. The result is "My Mom and the Girl," a short film written, directed and produced by Susie Singer Carter, who plays opposite Harper in the story drawn from the filmmaker's experience with her own mother, Norma Holzer. "The film was joyful to make, as well as emotionally difficult," Harper said. "There is a real joy to it, as well as sadness." Harper etches the disease's unpredictability as her character, Nanny, whipsaws between awareness and confusion, warmth and anger. Carter portrays her devoted daughter, and the "Girl" in the title is a transgender woman (Harmony Santana) whom Nanny meets when she ventures out on the street one night, as Carter's mother did. Liz Torres plays an affectionate caregiver. Carter said the story of her mother's ongoing experience with Alzheimer's needed to be told, but "I resisted it for quite a while. I would tell anecdotes about my mom and people would say, 'You have to do a movie, you have to write that.'" "'That's the last thing I want to do, is live in this world more,'" was Carter's response. Then she realized she had an obligation to tell the story, "and it all lined up the way it should," including Harper's participation. The film's depiction of Nanny's undimmed spirit parallels both Holzer's and Harper's journeys, Carter said. Disease is "tragic and it's hard and it beats the crap out of you ... and it shifts your life in all ways that you wouldn't expect, and you don't want it to go there. But you're here and you've got to make the best of it," she said. The film, which relied on crowdfunding and support from the group UsAgainstAlzheimer's, was screened this month for Oscar consideration and awaits distribution. It's Harper's first time back at work after a series of health setbacks, said Tony Cacciotti, her husband and manager. She was diagnosed in 2013 with leptomeningeal carcinomatosis, a rare condition that occurs when cancer cells spread into the fluid-filled membrane surrounding the brain, and was given just months to live. She has disproved that prognosis. "Two or three times, she was out of it, she wasn't going to survive," Cacciotti said. Before a stage performance in 2015, she was rushed by helicopter from Maine to Massachusetts General Hospital in Boston, "where they saved her life," he said. A pressure-relieving shunt was placed in her brain after another crisis. Recently, he said, a drug that had proved a life-saver for the last four years started to lose its effectiveness, and Harper entered a second-stage trial for a new medication. She's also working to boost her strength with daily walks and hoisting light weights while watching TV. "She's a fighter," Cacciotti said. "I'm amazed every day what she can do, and now she wants to get back to work, which is very exciting." "I'm feeling great," said Harper, bubbly and upbeat during a phone interview, crediting her husband's loving care and doctors at Cedars-Sinai Medical Center in Los Angeles. Filmmaker Carter predicted that audiences will be surprised that Harper, who gained fame in "The Mary Tyler Moore Show" and as star of the spinoff "Rhoda," is so adroit at drama. She also gets to show off her singing voice, which she's displayed on stage and in the occasional TV variety show. "I think most of us know Valerie from her comedies on television but, my God, her breadth of work is extraordinary and her range is phenomenal," Carter said. "I was concerned initially, thinking maybe it would be too much for Valerie, but honestly, her energy was impeccable and incredible," Carter said. "She outdid most of us," she added, recalling a Harper's rallying cry on set: "C'mon, it's only 11 o'clock. Let's shoot another hour!"